Quite the change, right?! 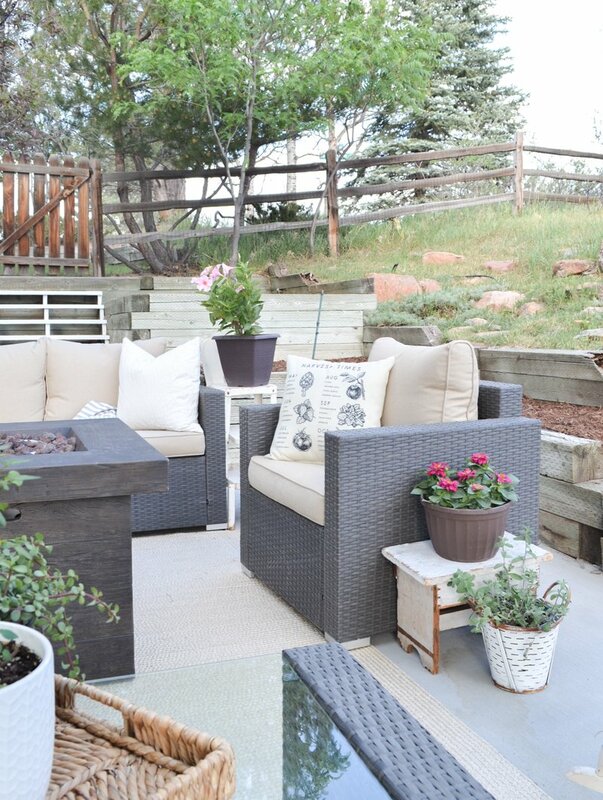 It’s kind of amazing to see how this empty patch of dirt and rocks has been transformed into the coziest little outdoor living space. We started by pouring basic concrete, which was honestly the most expensive part of this entire thing. Tell me, why is concrete SO darn expensive?! That was the part that was holding us back from doing this project last summer because we just couldn’t stomach the price tag. 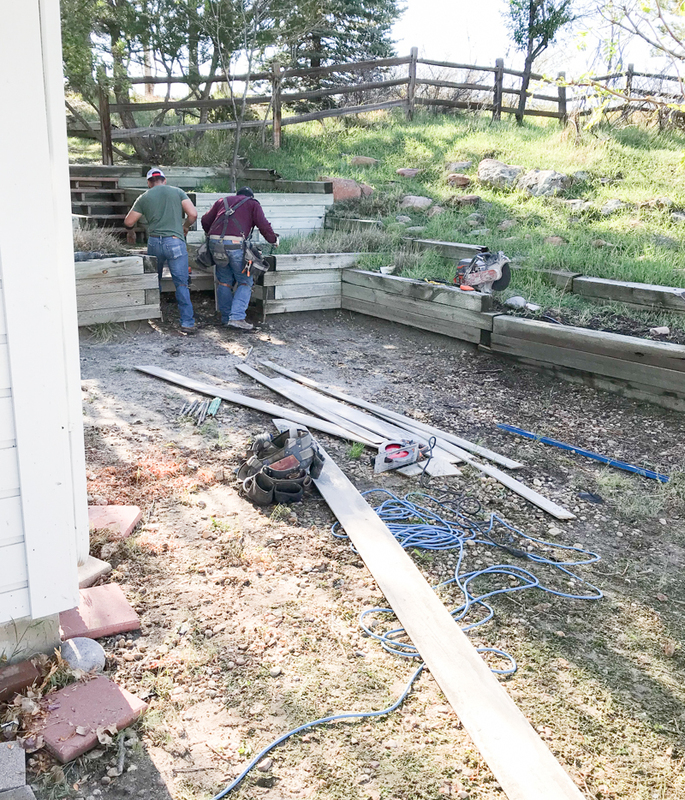 This time around we talked about doing pea gravel or even just mulch, but concrete was ultimately what we decided on and I’m SO glad we went that route. Even though it did cost a fortune. Kidding. Kind of. After the concrete was done I knew I wanted to make this space as cozy and livable as possible. 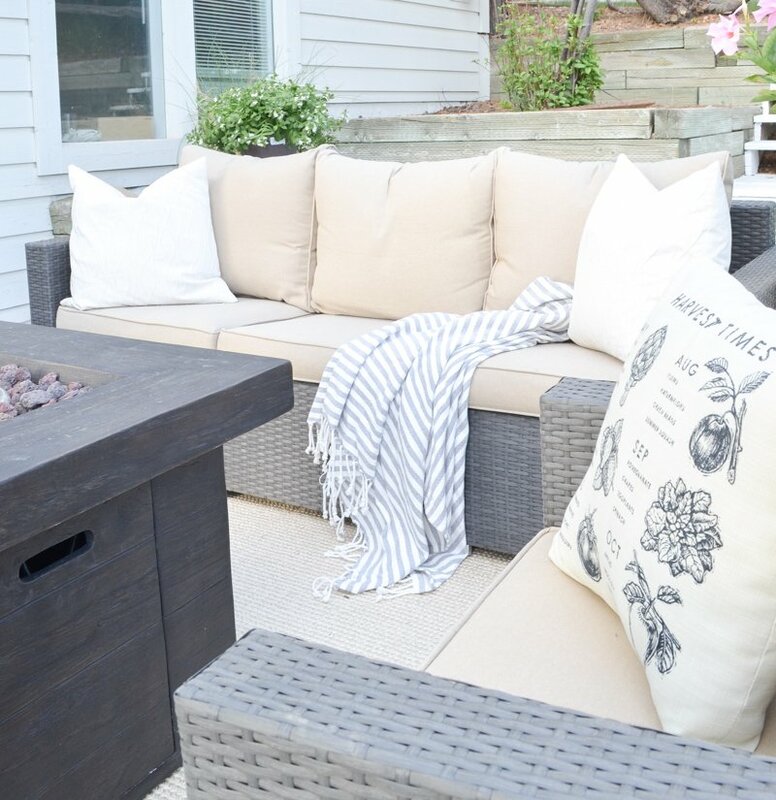 I mean, we want to spend as much time out here as we can this summer and that means we need COMFY furniture. I looked at a ton of different options, but we went with this four piece sofa set from Joss & Main. The reviews were all great and I love that this set has a very cozy, living room feel. I like the sofa/arm chair combo, so this is exactly what I was looking for. And it’s SO comfortable too. We absolutely LOVE it. 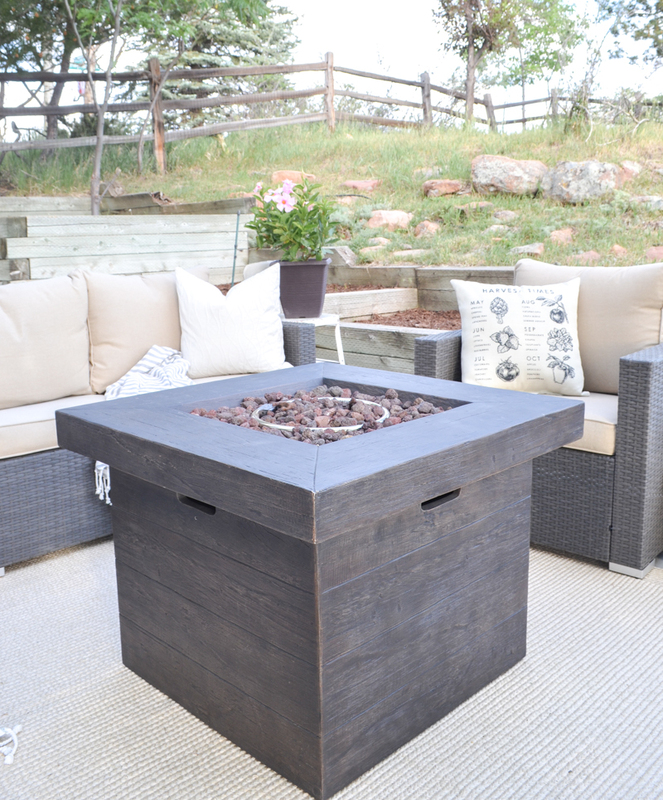 It’s always been our dream to have some kind of fire pit in this space, so that was a must for this makeover. 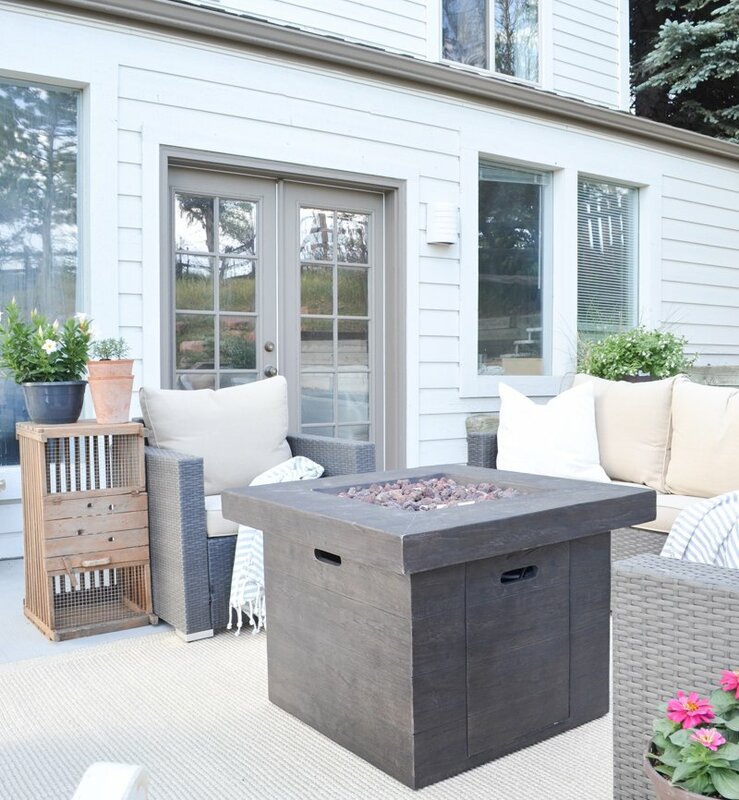 We decided on this gas fire pit table and we are basically obsessed with it. It’s great because you can enjoy the fire without the smoke smell or the hassle of actually making a fire like some kind of caveman. You simply flip the switch and BOOM. Instant fire. It’s just so easy. And easy is good. I tried to keep the extra decor and “stuff” out here to a minimum because I just wanted this space to be simple and comfortable. You know what I mean? I don’t want to worry about things blowing around when the wind gets up or when rain blows in. I just want it easy and livable out here, so I kept it really basic with just a few potted plants, a couple pillows, and that’s about it. This is the first big outdoor project we’ve taken on and I have to say, it was totally worth it. We’ve been practically living out here lately and it’s just so cozy. 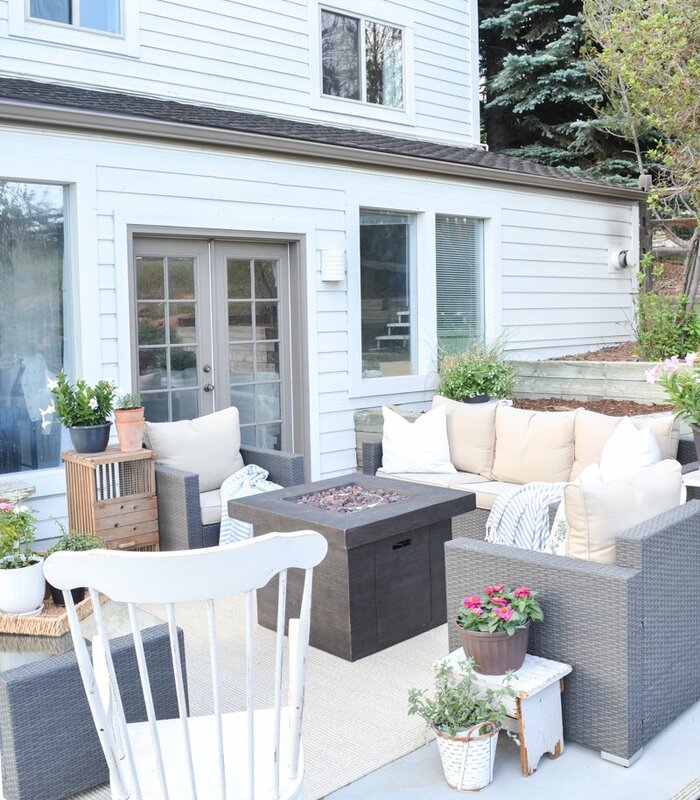 It feels weird using the word cozy to describe an outdoor summer patio, mostly because I think of cozy as being more of a winter-y/cold weather kinda word, but that’s really the vibe in this space. It’s just so darn comfortable. 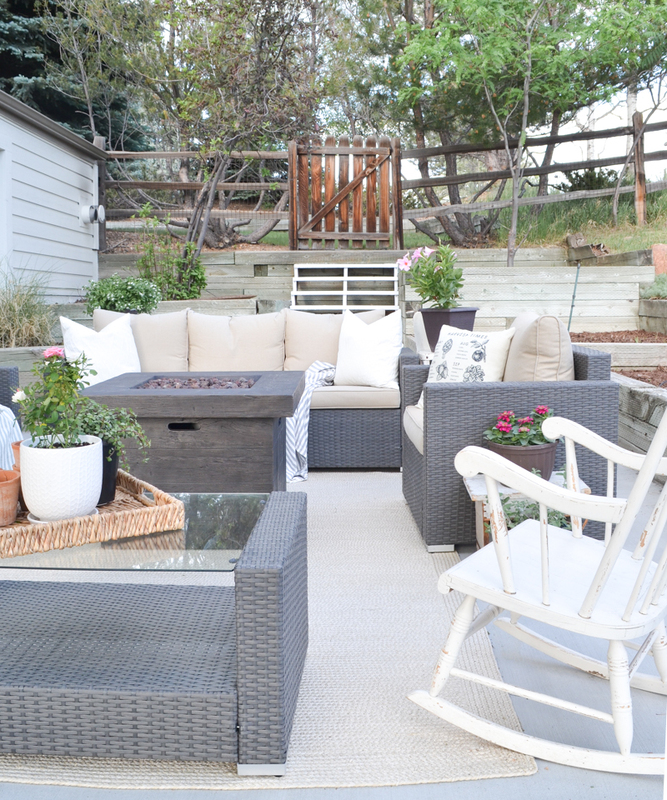 And it basically feels like an outdoor living room, which is pretty much the best thing ever and a HUGE improvement over the pile of dirt and weeds that was here before! Sarah it is beautiful! I love the furniture you selected. Definately looks cozy! Absolutely beautiful! I love this! Where is the rug from? How does it hold up if it rains? 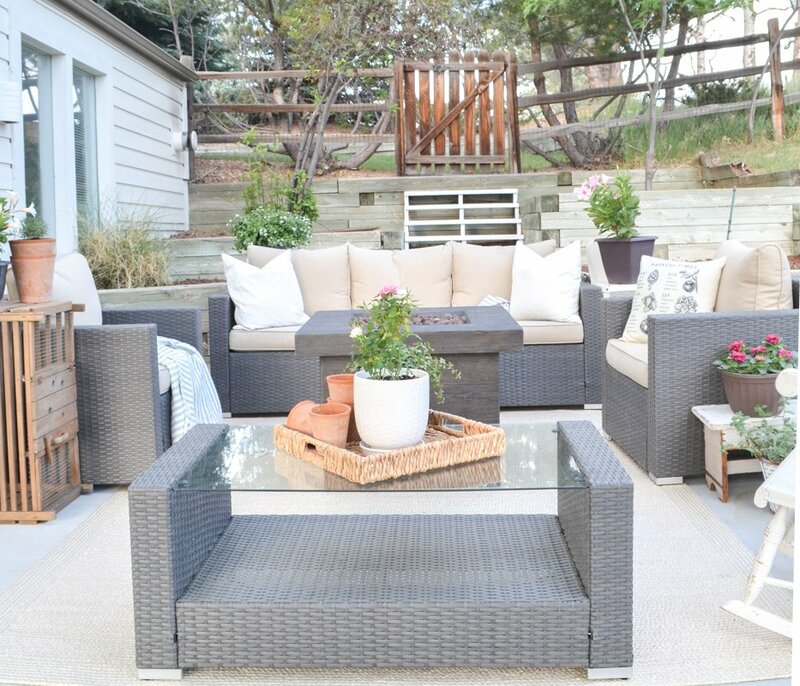 Sarah, what a beautiful outdoor space! This is exactly what I want for our backyard. Looks fabulous! This is gorgeous! 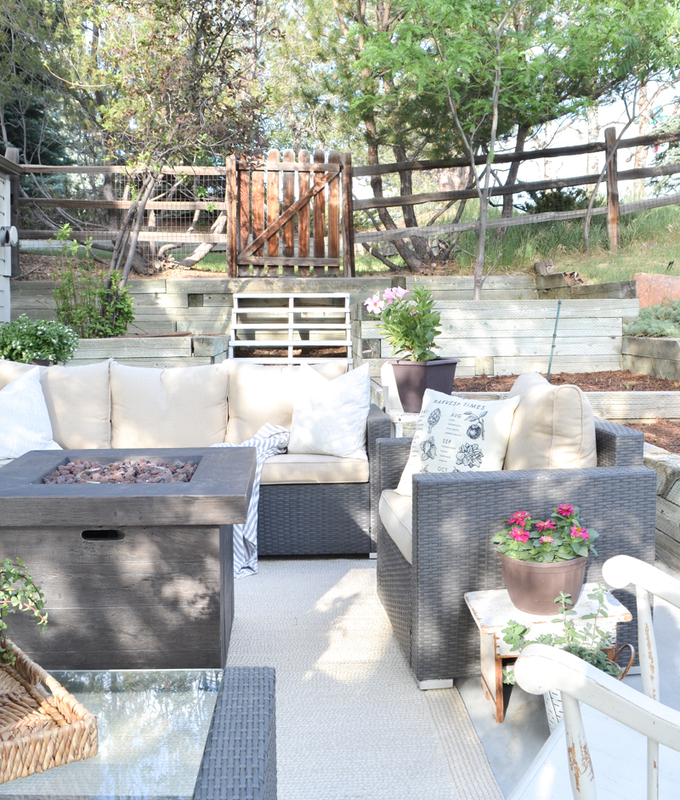 We have a pretty high deck and so much potential under that to create a second outdoor living space. This is giving me tons of inspiration! Definitely cozy. Only suggestion, as a senior and grandparent, would strongly recommend handrails on those steps. It’s beautiful!! I know you live in Colorado, so will you leave all this out all winter? Or will you have to move it in to storage or just cover it and take the small stuff in? We just added a Trex bar top table out by our grill on our terrace and we eat out there as much as we can. We love it. Enjoy your new space, and so glad your mom is doing better. Very nicely done. how do you protect everything from the weather? Fantastic transformation, a job well done! 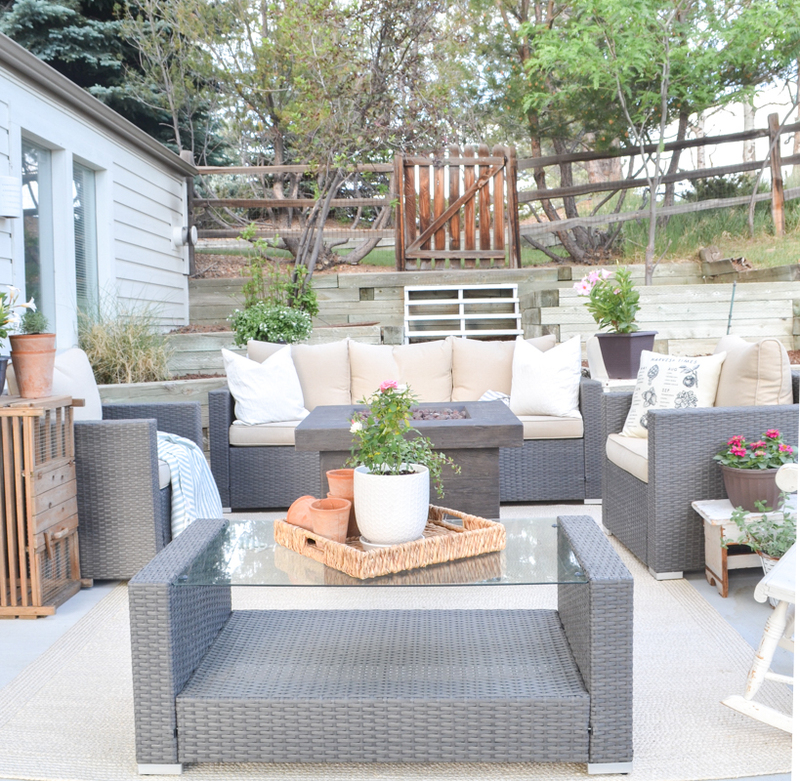 You will always enjoy you outdoor space year long, there will be something fun to do outside in your patio! 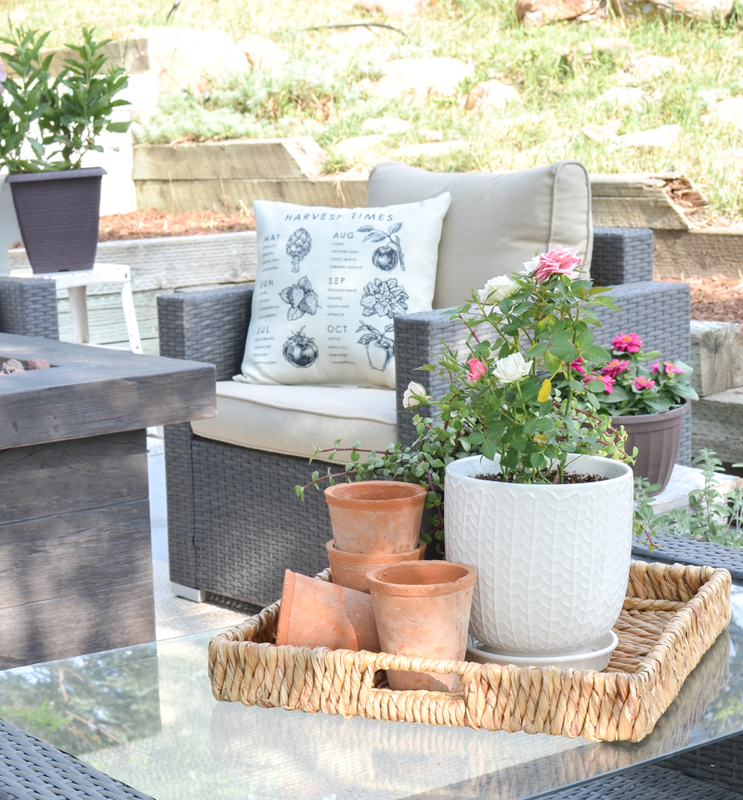 Love your patio! So beautiful and cozy looking. 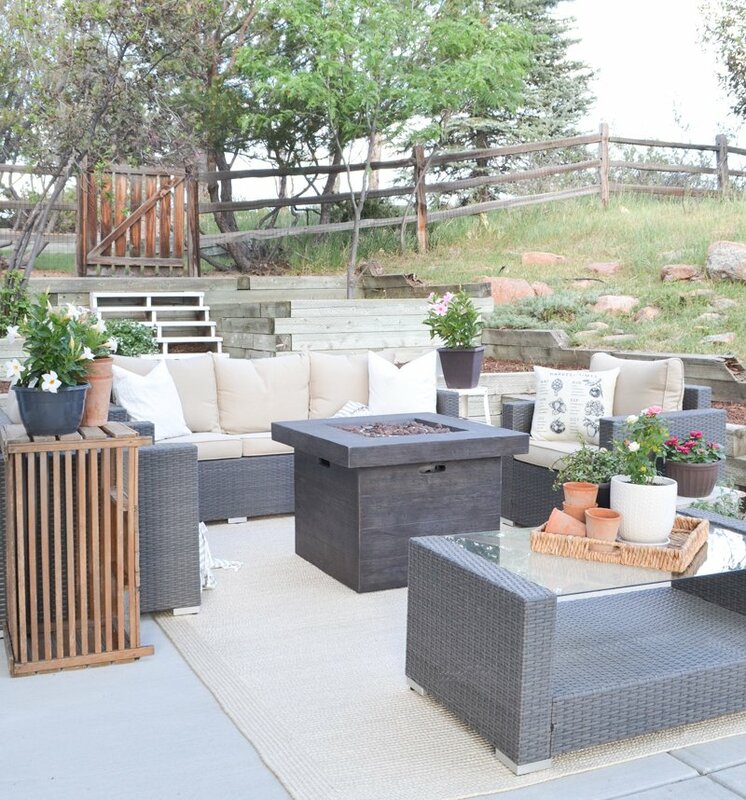 I’ve been wanting an outdoor living space. 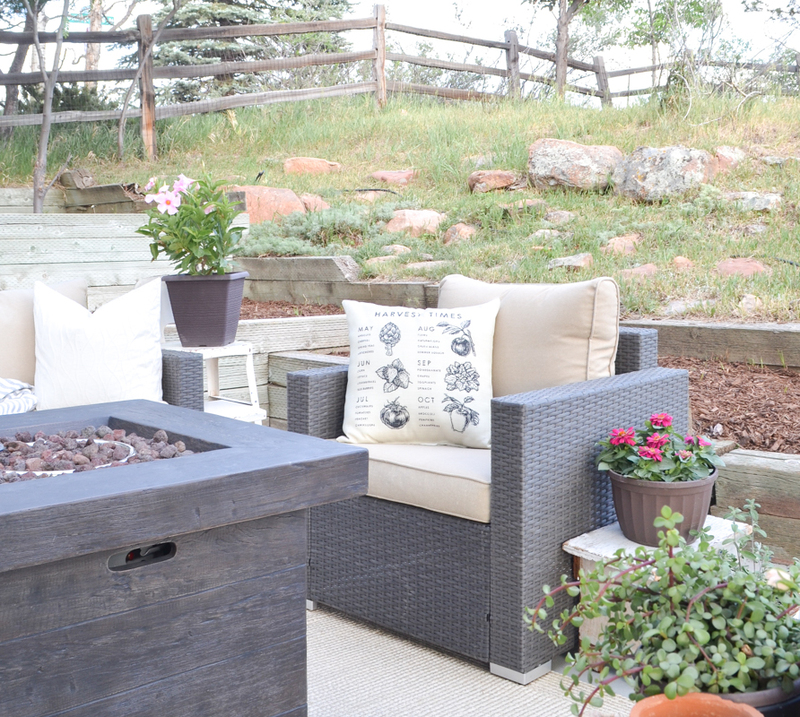 Does patio furniture do ok in the rain? Do you have to have a covering? WOW..What a transformation! I absolutely love how it looks, (as always) everything you picked out is just perfect! Your place is just more amazing with each project you guys do..I really think you guys could be the new Chip & Joanna!!! Oh wow! Sarah it looks so beautiful and serene!! That looks fabulous!! 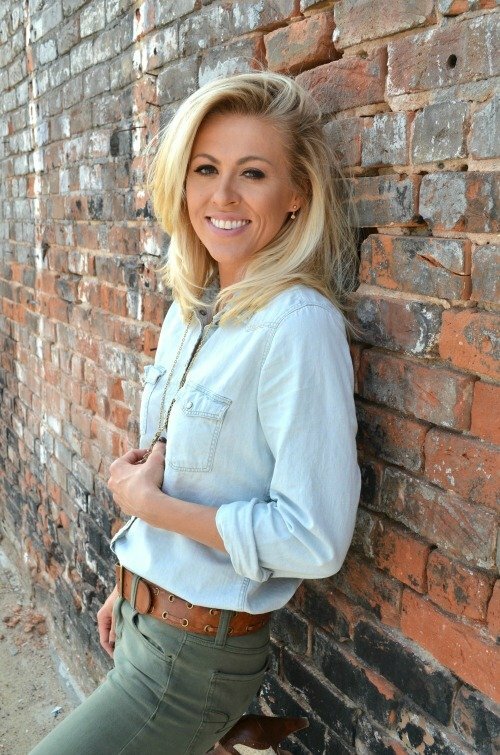 We’ve talked about pouring concrete on our back patio. Looking at yours, I think we need to bite the bullet. Where did you get your end table, next to the chair? You have out done yourself. Looks just like you, Fabulous !!!!!!!!!!!!! 🙂 Every detail is just perfect. Love the space. We did a treated wicker couch and 2 chairs. I wanted Sunbrella cushions but the price is outrageous so we went with a Martha Stewart collection that came with cushions that are treated. We live south of Boston and it has been raining frequently so I bring the cushions in the house. Kind of a pain but worth keeping them nice.